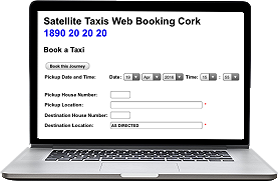 Satellite Taxis are the only taxi company in Cork to offer you, modern spacious and clean cars, uniformed drivers, credit card transaction terminals, C.C.T.V. and G.P.S. with sat nav. We are open 24/7 365. We will cater for all your transport needs, long or short journeys, courier work, airport, bus or rail pick-ups, golf tours, fishing trips, hen or stag parties, etc. All our taxis display fare cards and the photo id of our drivers. We use digital taxi fare meters, providing electronic printed receipts, stating time journey started and finished, distance covered, etc. Satellite Taxis can provide you or your company with a personal or corporate account that allows you to use a signature instead of cash for all your transportation needs. Satellite Taxis now offer our customers a Chauffeured Limousine Service.